An interactive learning module for cardiac CTA using real-world emergency department cases and full datasets to be manipulated with a 3D viewer. 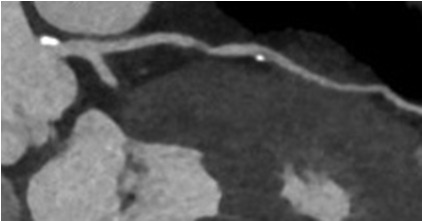 Cases also include the CAD-RADs scoring system, invasive coronary angiography correlation, and teaching slides on important points in evaluating coronary artery disease. Welcome to the Real World Emergency Department Cardiac CTA course on RadIQ! All fifty cases collected here were acquired in the emergent clinical setting on patients presenting to the Massachusetts General Hospital emergency department with symptoms concerning for acute coronary syndrome(ACS). The TIMI risk score is listed for each patient, all of whom were classified as low to intermediate risk for ACS, had negative serum cardiac biomarkers and had an EKG without ischemic changes prior to undergoing the scan. Teaching slides at the conclusion of the case will illustrate the key lesions and associated teaching points. IMPORTANT: These modules must be viewed in Google Chrome to see the teaching slides in full size. When the teaching slides are displayed, right click on each and choose “View in New Tab” to see in full size. Feedback is welcome and we hope this is an excellent learning experience for you! The course consists of 50 cases. Each case consists of a completely scrollable DICOM dataset with multiple choice questions. Selected invasive angiography videos will then be displayed, also with multiple choice questions. Please answer all the questions. Once you have answered all the questions for the case, you will be presented with the feedback and teaching points. You can compare your answers against the correct answers for the case. After completing a case, you will not be able to go back and change your answers. 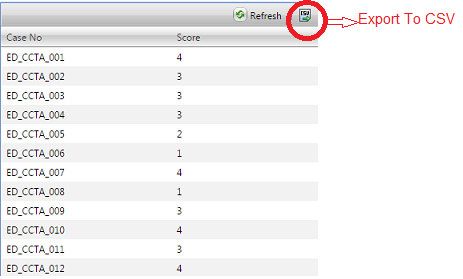 When you have completed all 50 cases, a tab will appear in the upper right hand corner that says “My Score”. Click here and then export the score file to Excel to print. On the small multiplanar views to the left, hover to the center of the crosshairs untill you see an open hand; click and drag to re-center crosshairs. On the small multiplanar views to the left, hover to the center of the crosshairs untill you see a pointing hand; click and drag to rotate the crosshairs. Double click on any of the small multiplanar views on the left to make them the large primary image on the right.